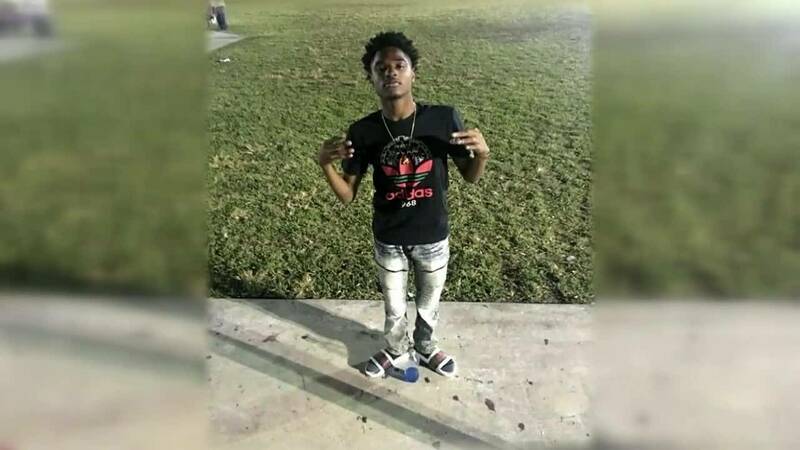 HOMESTEAD, Fla. - A 17-year-old boy was shot and killed Sunday in Homestead, police said. Miami-Dade police Detective Alvaro Zabaleta said the teenager was sitting on a park bench at 600 SW 14th Ave. when three males approached him and opened fire. The victim's girlfriend identified him as Jatavious Williams. She said she is due to give birth to their first child in April. Jatavious Williams, 17, was fatally shot in Homestead. "We have been going through this years at a time. Nothing changes. It stays the same," Deven Smith, who visited a memorial Monday for Williams, said. Zabaleta said an officer suffered minor injuries after he tripped and fell while responding to the shooting. Williams was pronounced dead at the scene. "He's 17 years old, the same age my daughter was when she got killed," Regina Talabert said. Talabert, a community activist who lives nearby, said her daughter was killed by gun violence in October 2015. Talabert said she is now part of a group that offers a packet to grieving mothers, advising them on the steps to moving forward after gun violence-related death. "The guns need to come off the street," Talabert said. "The kids are getting the guns too often and too easy." Local 10 News reporter Neki Mohan caught up with Williams' family Monday as they were returning from planning his funeral, however, they were too distraught to comment at this time.